Come aboard our beautiful 82' schooner, where you'll sail with the wind as you search for those elusive giants of the deep, humpback whales. 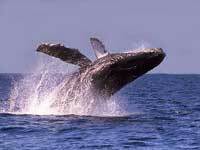 Every year, between December and March, Mazatlan is blessed with the migration of these amazing creatures, and we now offer you a unique way to spot them while at the same time having a comfortable and enjoyable day of sailing with our Whale Watching tour. You day will begin with departure from the marina, where the sails will raise, and you'll be whisked off with the breeze to the high seas, where your expert captain and crew will treat you right, while your quest for whale sightings ensues. Your crew will explain to you about the whales, their habitat and history in Mazatlan, and you will likely have the opportunity to photograph one or more of these gentle giants. The next stop is uninhabited Deer Island, where you can enjoy snorkeling, relaxing, or a rousing game of beach volleyball. Climb to the top of the island for enormous 360 degree views if you like. Then it's time to board the boat and sail your way back to Mazatlan! Sail with the wind across the bay like the Conquistadors of centuries past, exposing panoramic vistas of the Mazatlan skyline as you cruise effortlessly across the gorgeous deep blue water! The search is on - join the crew in spotting for whales! You might see humpback whales, orcas, Bryde's whales, Fin Whales, or even a playful pod of Pacific Bottlenose dolphins! Take as short hike to the top of Deer Island, where you'll be treated to magnificent views of Mazatlan's city skyline, as well as 360-degree panoramas! Enjoy snorkeling along the shoreline of Deer Island, witnessing many species of tropical fish and other marine life! Cruise Passengers: Yes! This tour makes a great shore excursion. Pick-up and drop-off from your pier is included! Runs: Daily from 9:30 AM to 2:00 PM from December 1 through March 15 only. 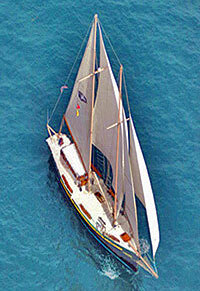 The rest of the year, try our Patricia Belle Sailing tour. Departs: Free Pickup from Your Mazatlan hotel. Cruise passengers will take a taxi from the pier to the marina. Round-Trip Transportation to Marina except Cruise Passengers. If you'd like to have a chance to spot for whales, but the idea of a small boat with no bathrooms doesn't appeal to you, then this tour is for you.